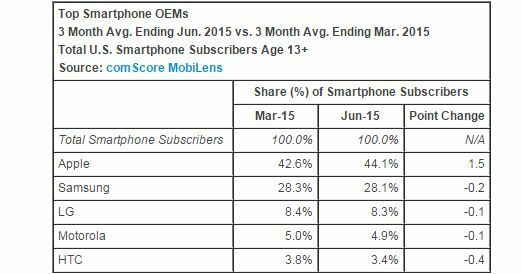 Market research firm ComScore has released its latest report for USA Smartphone Market Share report shows that there is an increase in in iOS market share and slight decrease in Android as well as other platform share of market in USA in month of June 2015 compare to month of march 2015. 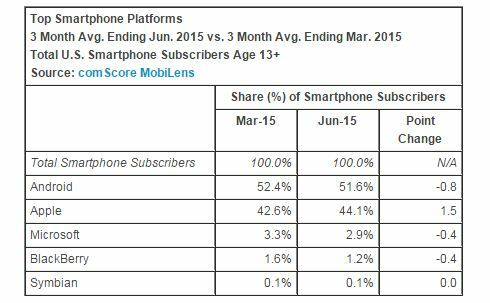 As you can see in above below Android remains the top Smartphone platform in USA with 51.6% market share.while ii was 52.4% in the month of march so there is some loss of market share for Android in month of june 2015.While iOS share was up from 42.6 % to 44.1 % .On the other hand Windows,BlackBerry and Symbian are on the top 5 list as a platform provider with 2.9 % (down from 3.3 %),1.2 %(down from 1.6 %) and 0.1% market Share respectively. If you see the Image below as for top Smartphone manufacturers,Apple is on the top with 44.1% market share ,while Samsung comes in second place with 28.1% market share .on the other side LG,Motorola and HTC are in the top 5 list with 8.3%,4.9% and 3.4% market share respectively. 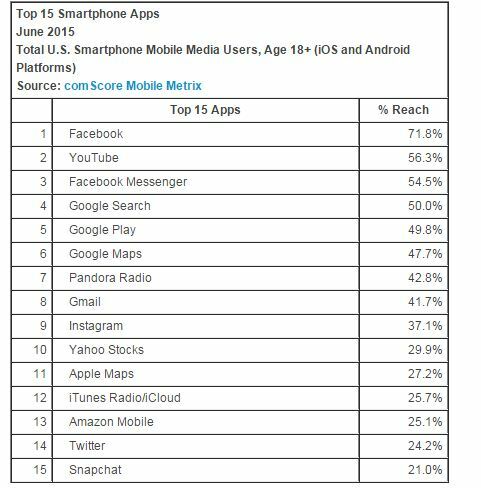 If we talk about the top Smartphone app Facebook ranked as the top smartphone app with 71.8% of the app audience , followed by Youtube (56.3%), Facebook Messenger (54.5%) and Google search (50%) in USA month of June 2015.